Gold production in the world in 2010. Demanding investors appreciate when the gold price is low, while the majority of the investors is depressed as gold production is declining in general indifference. In 2010, with an increasing gold price, an increasing gold production and an increasing interest of investors for gold; our demanding investors are concerned. Will the world be overwhelmed by gold as its production is increasing? I. The major gold producing countries in 2010. China gold production is increasing for the eleventh consecutive year. China is the world largest gold producer for the third time in history with 345 tons of gold produced this year. Furthermore among the gold-producing countries, China, with its increasing gold production, seems to go against the general trend.of decreasing gold production. China has already announced that its gold production is expected to increase up to 400 tonnes within the next three years. Australia is the world second largest gold producer with a gold production of 255 tonnes in 2010 (+15%). However this remains 20% below its level of production of 1998. The U.S. production of gold has been declining since 1998 (-37%) until it has stabilized around 230 tonnes/years in the last 4 years. Russia maintains its gold production at the same level; about 190 tonnes . Gold production in Peru is still below its peak production of 2005 (208 tons of gold) with 170 tonnes of gold produced in 2010. Although one can identify more than three hundred mines and gold producers in Perou, more than half of the production comes from two major gold mines (22% in 2010) located in a gold mining region of the Amazon rainforest ( 4% in 2010). Indonesia produced 120 tons of gold in 2010, -27% since its peak production in 2006. Half of it, is produced by one single company which production has declined by 7% in 2010. Canada remains well below its level of production of 1941 (166 tons of gold) and 1991 (177 tons of gold) with 90 tonnes of gold produced in 2010. The share of small gold-producing countries (Argentina, Bolivia, Brazil, Chile, Colombia, Ghana, Kazakhstan, Mali, Mexico, Morocco, Uzbekistan, Papua, Philippines, Tanzania, ...) accounts for more than a third of the world gold production in 2010 against less than 10% in 1969. To find new deposits of gold, mining companies must go deeper in hostile territories such as deserts, rainforests and polar region to find the last remaining gram of gold. II. Production peak or just the end of a cycle? Both in 2009 and in 2010, I announced the possibility of a temporary increase of the world gold production as a result of lower production costs due to 2008 crisis effects. 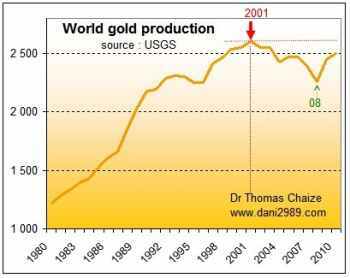 I also confirmed you the peak of gold production in 2001. Since then, global production increased by 240 tonnes reaching 2 500 tonnes in 2010. It is now legitimate to question the sustainability of this increase in the world gold production. In 1980, in a similar situation, when gold production increased, it brought down the price of gold during 20 years. 1: From 1970 to 1980 there has been a decline and then a stagnation in the world gold production resulting in higher gold price (positive divergence). The price was too low for several decades, forcing some gold mines to close as production costs were above the selling price. 2: From 2001 to 2008, we had a decline in gold production and higher prices from 2008 to 2010 (positive divergence). Gold production decreased by 340 tonnes while the gold price has tripled. The prices were too low to encourage the opening of new gold mines as well as exploration. Since 2008, both the gold production and its price on the market has been evolving in the same direction. Usually in this case, as a “normal” cycle, we should eventually be in an oversupply situation and therefore worry for the market price of an ounce of gold. The increase in the price of gold for the last 10 years should lead to overproduction and inevitably to a reduction of the price (negative divergence). This should then be followed by a reaction of gold mining companies which would open new gold mines, producing more as well as exploring new areas. But since 2001, the old models of cycles are obsolete, since gold has already reached its production peak. We are now in a sort of super cycle "terra incognita". Production costs were slightly and temporarily stabilized in some gold producing countries after the 2008 crisis. With the slight decrease (or stabilization) of production costs for gold mines and the increase of gold price,we observe a temporary increase in the world gold production. But this is a pause and not a change of trend, structurally nothing has changed. Within 1 to 3 years, the world gold production will decline again, just because no country will be able to produce 1000 tons of gold like South Africa did in the 60s. III. Gold production in 2010, 2020 and 2030. 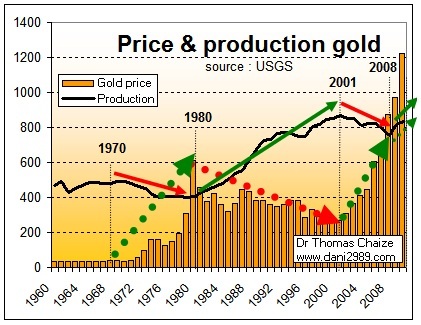 Gold production has increased by a factor 2.1 from 1959 to 2010. At the same time, the world population has been multiplied by a factor 2.2. Thus we produced more or less the same amount of gold per inhabitant as in 1959. When one does the ratio of the gold world production and the world population, we can see that gold production was of about 0.36 grams per inhabitant in 2010, which is close to the average over the last 100 years (0.37 grams). According to estimation the world population should reach 7.2 billion in 2020 and 8.2 billion in 2030. This should indicate us a “necessary” gold production of 2803 tonnes in 2020 and 3034 tons in 2030. In the short term (1 to 3 years) as discussed previously, the world gold production could still increase slightly, but in the next 10 or 20 years it will definitely decrease because of the number of good quality gold reserve. A difference will appear between the increase in the world population and the decline of the gold production. The world will produce less gold with a growing population and an exponatial growth of the money supply. U.S. money supply, M3, has increased by a factor 35 only between 1959 and 2006 (since March 2006 the U.S. federal bank does not communicate the amount of dollars printed). «And the time scale is not centuries, it's decades» February 1983 « Geophysics magazine».